"A hose sprays an Annapolis Naval Academy freshmen, Class of 2016, as he and other Plebes climb the Herndon Monument at the U.S. Naval Academy on May 20, 2013 in Annapolis, Maryland." Since moving back to Maryland I've been cataloging a list of events and stories I want to cover in and around the Baltimore, Washington metro area. One of them is the Herndon Monument climb at the U.S. Naval Academy in Annapolis, Md. I was fortunate enough to get the opportunity to cover the event last minute and was super excited to be able to document the visual climb. 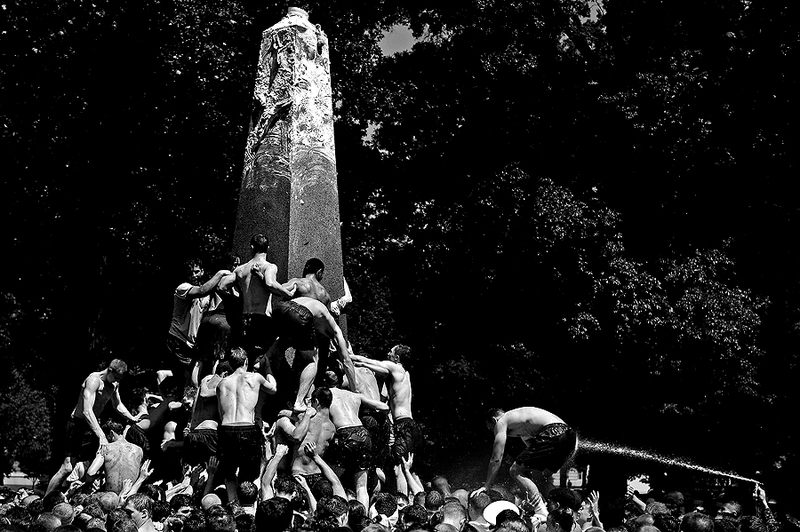 Each year the freshman class, known as 'Plebes,' climb the lard covered 21-foot high Herndon Monument at the U.S. Naval Academy to retrieve the Plebe hat and replace it with an upperclassmen's hat. At the sound of a loud canon, about 1,000 Plebes rip off their shirts and stack on one another making human pyramid, doing whatever it takes to replace the hat, and after lots of pain and sweat they replaced the hat in less than two hours. The annual tradition is a right of passage for the students. The event is grueling physical challenge that demonstrates the Naval Academy's team work, persistence and camaraderie in the slightest of words. Time flew by and before I knew it they completed the challenge that reminded me of that great feeling to be apart of a team and work hard for the same goal.